I took two students to Auschwitz this week. So much has been written about it that it feels like there are no more words to write. And what would be the point? In fact, what’s the point of going there at all? Historians tell us that one and a half million people passed through the gates, loaded into cattle trucks, worked like animals, treated like animals, and eventually slaughtered like animals. One and a half million. This is an impossible number to grasp; like encountering a wall that stretches left and right forever, only to be told that it’s not a straight line, but a vast circle, immeasurable and incomprehensible. There’s no purchase on such a statistic; it refutes all attempts to reduce it to anything that can fit in one’s imagination. The Holocaust deniers take what might even be an understandable view: such a figure is impossible, they say. No, it was only half a million, or a hundred thousand, or none. The very scale of the Holocaust cloaked it in the invisibility of disbelief during the war; the Allies and even the Jewish nation at large couldn’t conceive of its possibility. Does the figure even matter? On one level, no. Two million dead in the Killing Fields of Cambodia; twenty million starved under Stalin and Mao; hundreds of thousands in Darfur, Yugoslavia, Rwanda. The mind’s eye blurs them into a tragic mass, all capability to discern and distinguish individuals crushed by time and distance, by the space between the one of ‘I’ and the overwhelming multiplicity of ‘the many’. But we are not doomed by this inability; there are ways to at least begin to understand. I cannot even contemplate a distance over, say, a mile, not vividly. The distance between here and Glasgow is 400 miles or so; impossible to conceive when I close my eyes. But I can get there, by travelling as everyone else does; one mile at a time. So it is with Auschwitz. The only way that we, singular, finite units can understand is by understanding each story, one at a time. To even try to do so is to fall into the seemingly endless chasm of Auschwitz. To not do so is to deny the very thing that animates and unites us; our humanity. One story; In 1941 Maximilian Kolbe, the Polish Franciscan Friar who was captured and sent to Auschwitz One, the first camp, converted from Army Barracks into a work prison. In punishment for a prisoner escaping, the Camp Deputy- Commander lined up the prisoners and selected ten to be taken away and starved to death as a warning. Kolbe stepped forward to take the place of one of the men instead- a man he didn’t know. They were kept naked without food for twenty days in an underground cell no bigger than a garden shed; Kolbe lasted so long that, impatient, the Commander ordered his death, by injection of carbolic acid. That’s one story, and admittedly an inspiring one. There were six and half million stories in the Holocaust, and every one of them is important because every life is important. Kolbe’s story is exceptional because it describes how the purest of motives and deeds can perhaps only blossom in the darkest of soils; the brighter the light, the deeper the shadow behind it. Visiting the cramped, exposed cattle sheds where human beings huddled together with each other three to a bed, some dead, some alive, some dying, most rotting with dysentery, typhus and excrement, the miserable, insufficient sanitation, seeing the chambers where Mengele experimented on Gypsy twins, the starvation rooms, the ash pits where cremated remains were buried…it piles horror upon horror until you feel buried under its weight. No wonder numbness is a common reaction. And how did we react? As I walked around with Emily and Dami, two fantastic students, we fell silent very quickly, as did everyone. The place cows you into sincerity and sobriety as you start to absorb each grotesque diorama. Iconic images like the Arbeit Macht Frei sign above the entrance are emblematic of every horror film imaginable; worse, as any artistic representation of horror can only feebly mirror the monstrous life here. Again, it is magnified into an infinite regress by the numbers involved. Such films seek to shock and disturb with their careful attention to our fear of pain, but Auschwitz presents us with something worse: a testimony to real torture and pain, endured not by a cast of a few dozen, but of millions; not over a comfortable hour and a half, but over years. For me, curiously the exhibit within the museum that touched me the most was the collection of spectacles, thousands of them, stripped from their owners in the Sauna as they entered, and recycled by the Nazis. They sat in an enormous ball of steel, chaotic and bent, behind glass. Every single pair of legs embraced a human head, and the brain within; their memories, their personalities, their ambitions and their life. Each life as incomparably precious to its owner as my own. I felt my own glasses sit heavily across the bridge of my nose and tried to imagine them as part of that enormous heap in front of me, myself as vanished and eradicated as they were. For others it was the room full of human hair, bleached grey by time; for some it was the thousands of artificial limbs, or the enormous room full of suitcases, each one written with the name of its owner, some of them bearing return addresses. The refugees had brought everything they thought they would need, and to see the collection of useless, pathetic artefacts was pitiful in the extreme. They thought they were going to be relocated; instead they were buried. Someone had even brought a set of measuring scales. Can you imagine? A set of cooking scales. In Auschwitz. On and on and on it went. Finally, as the Sun set, we gathered around the memorial in Birkenau, Auschwitz II, where the train tracks ended. By now we had the camp to ourselves. Rabbi Barry Marcus led our group in a service. He provided us with something that I think the visit needed; a clear voice of outrage. It is fine, up to a point, to be reflective, and introspective, and measured in one’s response to the place, but allowing it to be seen as darkly as we wish, we risk reducing the Holocaust to something almost comfortable and ignorable. He spoke eloquently and beautifully about the necessity of seeing Auschwitz for what it was: the celebration of death; an assault on what it means to be human. As he blew the Shofar Horn and its lonely note sounded in that dark camp where so very recently, Judaism was being rounded up and reduced to lampshades, fertiliser and soap, I realised how vital it was to keep that fact clear in our minds. In a secular age where the old ethical foundations have been unsettled and often toppled by the moral earthquakes of the twentieth century- of which Auschwitz was an essential agent- moral relativism and non-cognitivism are often attractive intellectual and emotional responses to a world that seems to display no inherent justice or provide any karmic reassurances that the good will be rewarded and evil punished. And I can see that, I really can. But Auschwitz reminded me that, despite the obvious presence of an ethical compass, pointing to True North, this one thing remains: if this is not evil, then nothing is, and nothing matters, and nothing has value. Let Auschwitz stand as a bloody foundation stone to a moral pyramid, if something has to. Let every principle and creed evolve from this axiom: Auschwitz is the anti-life. 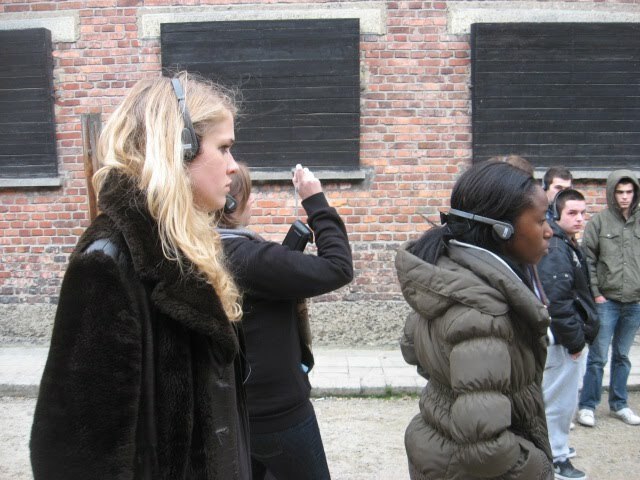 School trips are rightly aimed at enriching the experience of the students who participated. A place like Auschwitz becomes what you bring to it: on the surface of things, all there is to see are rows and rows of decimated sheds, rubble, pre-war barracks and abandoned avenues. Take away the history and there is nothing to see; the blood has soaked deep into the soil by now, and the adage that ‘here, nothing lives’ is a patent nonsense. Auschwitz teems with life; nature in its infinite variety breeds here with abandon and fecundity; sparrows swarm and even a faun dashed across our paths early in the evening, as a haunting counterpoint to the palpable presence of barbarity and death that we had steeped ourselves in. Dami and Emily had the sensitivity and maturity of spirit to bring to this trip what was required, as seemingly did the many dozens of students with us: humanity. The Rabbis finished his service in what was now night, by singing a low, slow Jewish prayer. It reminded me of sand, and sadness, and thousands of years of Diaspora, alienation and sorrow. Kitty Hart-Moxon, the Survivor who had spoken to us the week previously summed it up. 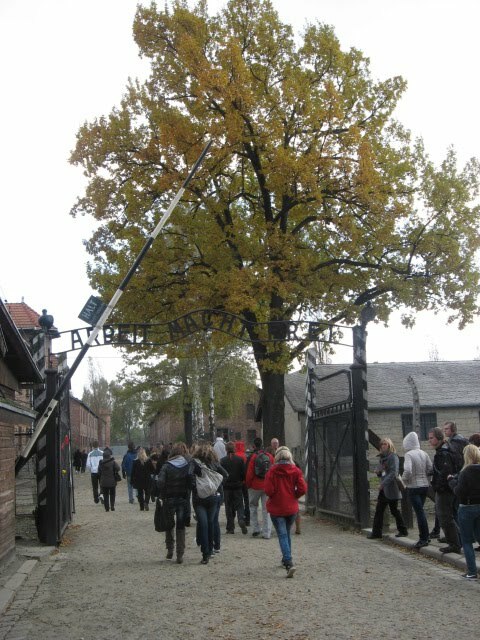 She said, ‘Everyone sees Auschwitz as a place where people died. But for some of us, it was also a place where you lived.’ As we walked back to the coach along the rail tracks in the dark, placing our candles along the sleepers and leaving them as sad punctuation marks in Auschwitz’s traumatised soil, I thought of everyone that couldn’t leave. Every life here mattered. Every life still does. The death of one person is a tragedy to us all; if it isn’t, then my life is also without value, because it is made of the same matter. Whatever happens to us when we die, wherever we go or not, we must treasure our humanity, and that of others; not because we fear death, but because we value life. Herr Einstein tells us that the nature of time is somehow simultaneous; that all pasts, presents and futures are wrapped together into a state of endless, perpetual presence. From this secular, emprirical perspective, no one who has ever passed is ever truly lost: lost to us perhaps, but enduring, existent in a way we can barely fathom. I find that comforting. The victims of death remain, somehow, even if it defies our perception. May they remain forever in the company of the ones they love.